Chips for breakfast? Listen, the state I’m in at 7.15 in the morning I can about manage a black coffee. Oh — not that sort of chip. I see. Slipped his Disc Drive? Charles Golding poses for the camera, looking suitably puzzled by some spoof computer printout. BREAKFAST CHIPS is TV AM’s new computer slot. It started in mid-April and packs into its five or so minutes features such as the Word of the Week, explaining jargon, software reviews and an up-to-the minute chart. The man behind it all is Charles Golding, also known as the station’s film reviewer. So why did he swop the large screen for the small one? ‘We’ll be trying to find a balance between serious computing and being software orientated — it’s a difficult one to strike,’ he told me a few days before the first transmission. Aiming not solely at the computer literate, he’ll try to demystify the micro, and instead of producing a slot for the enclosed world of hardware freaks and high score fetishists he’ll be showing how the computer can be used in everyday life. ‘We’ll be asking why buy a computer? What are its practical uses? And we’ll be looking at the more unusual games.’ Charles promises that they won’t be afraid to name rip offs either. These laudable aims are backed by a firm knowledge of the computer world. Charles Golding first came into contact with microprocessors while studying Political Science at Essex University. As part of that course students had to construct a model to test a political theory on the computer. 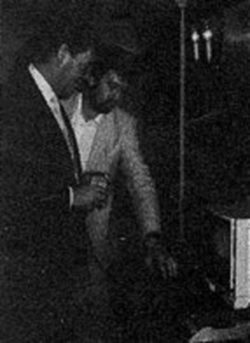 Despite having to program with punched cards he was hooked and now he is closely involved with the computer systems that keep TV AM up to the minute. Taking me through their airy Camden Town headquarters he explained how there is a circuit of sixty terminals connected to a central computer — that’s one for every journalist and more. All stories are typed in here and autocues, the scripts which presenters read from below the camera lens, are produced automatically. Meanwhile if a newsflash should come in from an agency, a message will appear on the screen and it can be called up in microseconds. Naturally the system also has access to vast databanks and allows for the cross referencing of scripts, as well as the highly accurate programme timing that brings all the items together into a whole. As a ‘super user’, Charles Golding is responsible for the programming necessary for system maintenance, all of which is a long way from loading a game into your Spectrum. Still, Charles has one of those at home, along with a BBC and a C64. On the way out we looked into the Roland Rat office. Though the Rodent Superstar was absent — probably on an elongated business lunch — all the trappings of his massive fan following were there. The latest cult item is a computer game from Ocean, in which Roland can be heard to speak. This little innovation has cost a clear hundred pounds per word, putting Roland in the same pay bracket as Marlon Brando! As we parted Charles again stated his intention, ‘To be fun — not heavily serious. To open eyes.’ You’ll be able to judge how well he’s succeeding at 7.15 every Tuesday morning. Oh dear — having dragged my festering carcass out of bed in time to catch Charles Golding’s Breakfast Chips at 7.15 the other morning, I was left with the distinct impression that I should have had a lie-in. Admittedly the poor man is always going to be fighting an uphill struggle (to mix a couple of metaphors), with only five minutes a week to explain all that’s new and wonderful in the Micro world. And maybe it is a little harsh to judge a series on the basis of one show — everyone has bad days — but after my initial experience, I won’t be getting up early just for Mr Golding’s output. Not only was the presentation rushed, (fair enough if you’re only given five minutes by the powers that be), but more significantly, most of the content was fatuous. Charles was focussing his attention on the Spectrum that morning, and succeeded in demonstrating that he was indeed a right Charlie. Word of the Week was ‘Disc’ — which was defined as ‘a round plastic object used for storing and retrieving information’. Well, yes, but so is an LP record. No expense was spared, every effort was made to provide an appropriate visual. Holding up a paper plate which had had a hole bodged in its centre with a pencil, Charlie announces that yes, it does look like a paper plate with a hole in it, ‘cos that’s what is is. I forgot the real one. But that’s what a disc looks like anyway...’, except it’s made of plastic, is much smaller and usually lives inside a protective sleeve. Charles then turns to the Spectrum in the studio. Commenting on the Microdrive and mentioning that the Spectrum doesn’t have discs, he utters the immortal words ‘whatever will they think of next’. Hmm. Floppy tape drives are hardly new, Charles, and how long has the microdrive been around? My Word of the Week has to be ‘Rubbish’. Stay in bed until Breakfast Chips stops being so much Breakfast Waffle. Micromatic, who supply the Timex Portugal floppy disc system for the Spectrum in this country have dropped the price of the disc system to £199 including VAT. Previewed by Franco Frey in the Christmas Issue of CRASH, the system looks to be pretty smart, and it contains its own processor. Soon we will have not only disc system but also a Timex 2068 in the office to examine closely — that’s the American version of the Spectrum. Watch out for further details, coming soon. Even on holiday it seems there’s no escape from Uncle Clive’s empire. While wandering the narrow streets of the capital of an island best known as the home of the world’s earliest civilization, what should I find but a shop stocking examples of the most modern technology. The INFO SHOW has been open around fifteen months and its business has been encouraged by Crete’s new university. With the Spectrum selling at 23,000 drachmas (£145) and the Plus at 31,000 (£195) prices are reasonable compared with many electronic consumer goods in Greece. There wasn’t the profusion of software found in Britain but apparently games sell well there. Which set me thinking, as I sipped my ouzo; what sort of programs would King Minos, whose palace at Knossos housed the legendary Minotaur in its labyrinthine lair, have bought? Maze games perhaps? Cunning wheeze these Telecom PR boys came up with. ‘Let’s run a competition which means people have to phone up for the questions,’ some bright spark must have said. One thousand Modem packs were up for grabs and to stand a chance of winning you had to make not one, but two phone calls. For most people in the country these two calls would have been long distance, and if a hundred people phoned up for each modem on offer, who knows the whole thing could have been self supporting. Mind you, 1,000 extra modem users will be the net outcome of the competition, and who gets all the telephone bill money from modem users... cunning eh? I suppose this is what Privatisation is all about. A lady from Gem Distribution ’phoned up last week to pass on the news that they have taken on Mizar’s Crash Smashed Out of the Shadows. Retailers having difficulty in getting hold of a copy can contact Gem and Gem will be happy to supply on a Cash on Delivery basis to retailers who haven’t an account with them. Nice People. Ian Andrew of Incentive got in touch to let us know that he’s offering an extra Incentive to CRASH readers who reckon they’ve mastered Confuzion. The first person to wander into his shop in London Street, Reading carrying a copy of this issue of CRASH who can play through all the levels of Confuzion will wander out of the office again £100 richer. The rules are simple — you must be able to play through the whole game in one go, and you’ll only have one try. If you’re travelling to Reading specially, it’d be a good idea to phone first and check that the prize hasn’t been won. If you ask them very nicely, they just might let you have a go in their C5 — named after the character in Splat! (Zippy). Something to do with having to avoid getting splattered when you take to the streets in it. Smiling, bearded Kevin Toms looked over the moon as he cut the cake to celebrate his third year as a division topping FOOTBALL MANAGER. Kevin’s evergreen success has maintained a healthy goal average, selling over 100,000 copies, so what better way to mark the occasion than a dinner at the Dorchester. 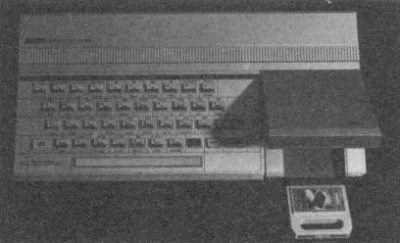 Football Manager is now available for nine computers, but while most people think that it began in the dark, or at least monochrome ages of the ZX81, Kevin revealed that it in fact dates back to a board game he created on a Cornflakes package EIGHTEEN years ago! He now sees it as a perennial, like MONOPOLY, and explains its success in terms of the burst of activity involved in picking a side and arranging transfers, followed by the suspense of awaiting the results. Following the dinner came the cake, representing a soccer match, and the presentation of a trophy to the Software Star from Southampton Supremo, Lawrie McMenemy, who appeared more than happy with the game’s strategies. So while other programs leave the public sick as a parrot and score own goals, Football Manager heads towards greater heights with its imminent entry into Europe. ’Ere, those boys from Dk’Tronics ’ave joined up with the team from Thames Television and they reckon they’re onto a nice little earner. You see, they’ve turned the exploits of me old china, Arfur Daley, into one of these ’ere computer games ... well, I guess Arfur ’ad some dodgy micros ’e wanted to shift. Strange the game’s called MINDER when Tel ’ardly comes into it, other than to shift boxes around. Still, there ’e is, along with Chisolm, Dave the barman and the rest, but the star’s indubitably Arfur. The punter ’as to bargain and barter, buy and sell and try to make an ’onest day’s in this simulation of the ‘Daley grind’. An’ those scallywags at DKTronics ’ave the nerve to say it ain’t educational. Well worth £9.95, I’d say. ’Earing all this I decided to take the jam jar down to the launch and blow me, if they ’aven’t tempted the man ’imself out of the Winchester Club, though ’e’s adopting the AKA of George Cole — probably trying to avoid the Old Bill. Not only that but there’s ’er indoors’ too, and their two saucepan lids, and a right charmin’ family they are. Still, it doesn’t take long before Arfur’s got ’is ’ands on the review copies and what d’yer know — ’e starts floggin’ em at a quid a throw to Fleet Street’s finest. You ’ave to admire ’is brass neck. Then, when ’e’s got over fifty nicker it transpires it’s all going to some charity, which is, well, nice of ’im — providin’ it ain’t the police benevolent fund! 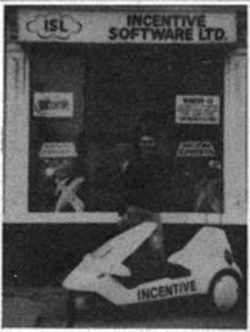 Eamon McGing’s moment of fame took place at 11.30pm on April 7th 1985. 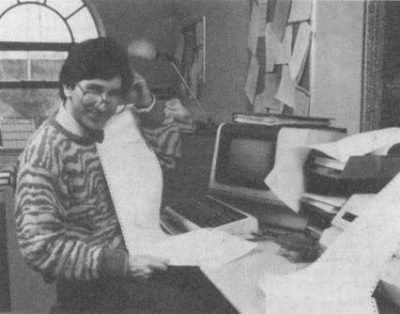 At that time, in a location very close to Camberley in Surrey, he completed Hewson Consultant’s brill game Dragontorc. Achieving High Lorelord status, he has been supplied with a citation for being the first person to complete the game and no doubt will go on to great things. 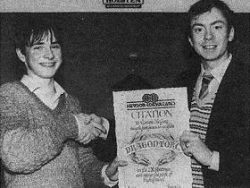 Could that be a Masonic handshake Eamon is giving Dragontorc Author Steve Turner? 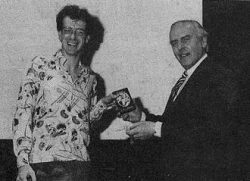 Pictured here with Peter Holme is Duncan Slarke, the fifteen year old winner of the Observer Home Computer Championship. He won out in the play off held in London’s Metropole Hotel the other weekend amongst a bevy of invading Japanese tourists who took over the lobby in waves during the afternoon. Duncan, who attends Salendine Nook school in Huddersfield won a QL, a giant cup and two tickets to visit the Epcott Centre in Florida generously provided by Quicksilva. ‘My mates won’t believe me when I tell them I won,’ Duncan told me. They will now. For the uninitiated, squash is the most potentially lethal game known to man (you should try the ancient Japanese martial art of Knaka’Kiki — Ed). Not only is it faster than tennis, ... not only does it all happen in an enclosed space, ... it’s also played with a harder ball. Which seems as good a reason as any for producing a computerised version. That way nobody gets hurt. Jonah Barrington, a former world squash champion, has other reasons for greeting New Generation’s micro adaptation. As a fervent populariser of the game he believes that it will introduce newcomers to the rules and excitement. He was only too happy to advise Malcolm Evans (of Trashman fame) and Paul Bunn on how to achieve maximum realism. He also lent his voice to the program, and his digitised scoring, which called for fresh hardware in its development, is to be heard during games. Malcolm Evans was also keen to stress the accuracy of the 3D movement. Jonah Barrington’s Squash is available for £7.95. Computer Trade Weakly, the well known typographical error is holding an auction on Saturday 15th June starting at 11.00am in the GLC County Hall. All funds raised will go to the Ethiopian Famine Appeal, and if you’ve got any software or hardware that you’d like to offer for auction in this good cause, get in touch with the fellows at Computer Trade Weekly, the well-known trade magazine. Otherwise you could just turn up on the day, pick up a bargain and add to the fund. 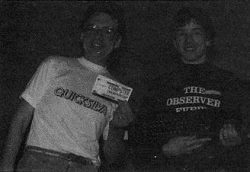 ZZAP and CRASH together; David Western, Julian Rignall and Oliver Frey. 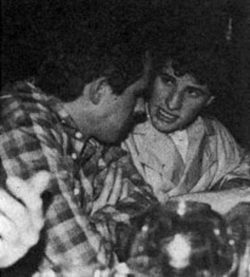 Playing Tipster Robin Candy and Oliver Frey (left) discuss adding more blood to an illustration. With joystick aplomb, ZZAP! Editor, Chris Anderson, prepares to stab the celebration cake. After a long meal, ZZAP! Editor Chris Anderson falls face down in his food. Round the table from left clockwise; Lucy Anderson, Graeme Kidd, Chris Anderson, Denise Roberts (just), Bob Wade’s head (Zzap), Matthew Uffindell, David Western, Sally Kidd, Julian Rignall (Zzap), the top of Robin Candy’s head, the front bit of Ben Stone’s head, Oliver Frey (standing), the back of Roger Kean, Gerry Penn sitting back (Zzap), and mail order queen, Carol — picture taken by Lloyd Mangram with assistance from Jeremy (jacuzzi boots) Spencer. Most CRASH readers must by now be aware that the publishers have launched a second title devoted to the Commodore 64. With Newsfield Publications’ aptitude for dull sounding names, the new magazine is called ZZAP! 64, and it is edited by Chris Anderson, the ex-editor of Personal Computer Games. Well, not so long ago, the members of the ZZAP! 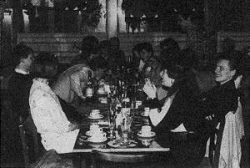 team came from their editorial base in Yeovil, Somerset up to Ludlow for a launch party which managed to flatten a perfectly respectable restaurant in the town. 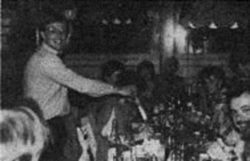 Noted for his camera phobia, Lloyd Mangram was allowed to take the pictures and their shakiness has nothing to do with drink.